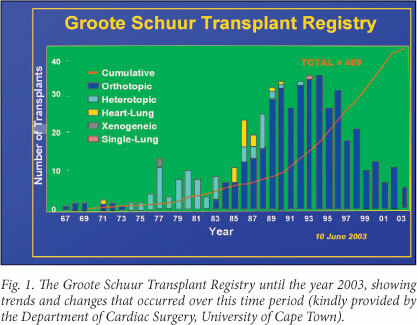 The heart transplant programme at Groote Schuur Hospital and the method was once again predominantly adopted. Early graft failure for University of Cape Town has continued uninterruptedly since the first various reasons remains a major complication, and heterotopic heart human transplant in 1967. Orthotopic heart transplantation was followed transplantation is perhaps the best way to deal with it. by the heterotopic method in 1974, considerably improving the clinical results. In 1983, owing to the advent of cyclosporin A, the orthotopic. Christiaan Barnard and his team performed the world's first human-to-human heart transplant operation on 3 December 1967. It was a major historical event and a significant breakthrough for medical science. This and subsequent events received front-page media coverage around the world for months on end, describing all aspects in detail and giving progress reports on the postoperative course of the patients. Between December 1967 and November 1974, exclusively orthotopic heart transplantation was performed. Ten such heart transplants were done, and a heart and lung transplant was also performed in 1971.1-6 Of the 10 patients who received orthotopic heart transplants, 4 lived for more than 18 months; 2 of them became long-term survivors, one living for over 13 years and the other for over 24 years. This last patient is remarkable not only for the length of his survival but for excellent recovery from the operation in spite of severe cardiac atherosclerosis at the time of the surgery. Within 3 months he had returned to work and did not miss a single day's work until he retired 15 years later. He died from a cerebrovascular accident after unsuccessful peripheral vascular surgery and lower limb amputations. Clinical experience with orthotopic heart transplantation showed that complex and difficult-to-manage situations often emerge. It has been established that full recovery of donor heart function takes place over hours to days after transplantation. Anoxic damage and myocardial cell necrosis of the graft can occur during harvesting or at implantation, especially if myocardial protection has been inadequate or prolonged. Air embolisation to the coronary arteries often contributes to this situation. However, such damage is mostly caused by the excessive catecholamine secretion that results from brain death of the donor. Poor function of the donor heart has resulted in many recipient deaths. Similarly, many recipient deaths occurred as a result of pulmonary hypertension, as the donor right ventricle is unaccustomed to pumping against elevated pulmonary pressures, resulting in acute irreversible right heart failure. The recipient's right ventricle, although diseased, has adapted with time and has hypertrophied, making it capable of maintaining the pulmonary circulation. Survival rates for patients at 1 and 5 years increased from less than 40% and 20%, respectively, with orthotopic transplantation to over 60% and 36%, respectively, when the heterotopic method was used. Forty-nine consecutive heterotopic heart transplants were performed on 43 patients during this 9-year period. We believe that the heterotopic method of heart transplantation has proven advantageous and that its wider application is therefore justified. From 1983 onwards the use of cyclosporin A together with much-reduced amounts of corticosteroids was started. The 'corticosteroid-sparing' effect of cyclosporin A looked promising at the time. When using cyclosporin A for immunosuppression, the only reliable means available to diagnose graft rejection remains endomyocardial biopsy of the donor heart. The cyclosporin A era resulted in the recommencement of orthotopic heart transplantation and the gradual decrease of heterotopic heart transplantation at Groote Schuur Hospital over the next few years. The vast majority of heart transplants performed during the next 20 years were orthotopic, and the total number of transplants performed until 2003 was 489 (Fig. 1). Although cyclosporin A has to some extent decreased complications due to rejection after transplantation, many other causes of possible complications in the early postoperative period remain12 and are a major cause for concern in heart transplantation units. We think that many of them could be circumvented by the use of heterotopic heart transplantation, and that its wider use should be seriously reconsidered. Before its clinical application, this method of heart transplantation was extensively investigated and validated in the experimental laboratory. The technical feasibility, ease and simplicity of the operation were demonstrated. It was proven that the space occupied by the transplanted heart in front of the right lung hilum does not contribute to mechanical or physiological ventilatory complications. Bronchograms performed about 2 years later on the second heterotopic heart transplant recipient demonstrated minimal compression of the right lung. In several experiments involving biventricular bypass it was found that by selectively fibrillating the recipient heart, the donor heart was capable of effectively supporting the total circulation. Intracardiac pressures and cardiac output measurements detected minor and statistically insignificant changes from the normal range. Full cardiac catheterisation studies of long-term surviving patients are performed annually, primarily to detect coronary atherosclerosis of the donor heart coronary arteries. These studies, often repeated in particular patients over years, have documented normal or near-normal haemodynamics at rest. This confirms that, once the hazards of acute rejection are overcome, the heterotopically transplanted heart can function physiologically and afford the recipient full rehabilitation. Under conditions of exercise or stress, the heterotopically transplanted heart will, like the orthotopic graft, respond in an atypical gradual fashion to increase its intrinsic cardiac rate, thereby increasing cardiac output and compensating for the increased demand. Experimental studies showed that with synchronous pacing of both hearts the extensively damaged recipient ventricle failed to open the aortic valve. It follows, therefore, that some stasis will occur within this dilated left ventricle with the subsequent possibility of thrombus formation. To avoid this situation, and also to derive maximal circulation contribution from the recipient heart, it was elected at one stage to implant a permanent pacemaker system in patients undergoing heterotopic heart transplantation. This pacemaker system consisted of atrial pacing electrodes on the right atria of the donor and recipient heart which were connected to two pacemakers of a special design, having a combined atrial sensing and a ventricular output electrode socket with a sensing discharge delay of 200 ms. In one patient a satisfactory long-term function of the pacemaker system was achieved; in another multiple complications occurred such as stimulation of the diaphragm and rectus muscles and sternotomy infection that necessitated its removal. Thereafter no more pacemaker systems were inserted, as it was decided that the possible complications far outweigh the possible benefits of their use. After extensive laboratory investigation of methods of prolonged myocardial preservation and documentation of adequate function after orthotopic transplantation of donor hearts preserved in this way, it was considered safe to apply these methods clinically. The donor heart in 4 heterotopic heart transplants at the time had undergone prolonged preservation of the myocardium. Ischaemic times ranged from 7 to 17 hours. Prolonged preservation of the myocardium of the donor heart was accomplished by initial aortic root perfusion with a hypothermic, hyperkalaemic solution, followed by continuous aortic root perfusion with an oxygenated hypothermic clear perfusate. For continuous aortic root perfusion the donor heart was suspended from the aorta in portable apparatus designed for this purpose. The fluid is recycled pneumatically using a pressurised gas cylinder of 97% O2 and 3% CO2. The design of this apparatus is simple and it is easily transported (but not yet by commercial aircraft, as it incorporates a pressurised gas cylinder). In the immediate postoperative period the function of the donor heart was adequate and it shared the circulation with the recipient heart. After a few hours postoperatively a gradual increase in contribution towards the circulation by the donor heart was observed in all 4 cases. However, the function of the heart with the 17-hour preservation period deteriorated after a few days and it had to be excised 3 weeks postoperatively, the patient remaining alive with his own heart. This deterioration was due to irreversible acute rejection. The other 3 patients did very well. Full cardiac catheterisation was performed in all 3 at 3 months postoperatively. In 2 patients the donor heart haemodynamics were excellent. In the 3rd patient, although haemodynamics were documented to be good, there was some concern since on angiography the donor left ventricular contraction was somewhat restricted. This may be related to bouts of acute rejection that this patient was experiencing at the time. One of these patients went on to be a long-term survivor and lived a normal life for over 12 years. Although this method of prolonged preservation of the human heart for transplantation in the heterotopic position has proved successful, there is room for improvement. Further modification of the perfusate solution is required to avoid the severe oedema formation currently seen. This may be achieved, for instance, by the addition of washed red blood cells to the solution. It is unsatisfactory that commercial aircraft cannot transport the portable apparatus for the donor heart; this factor must be overcome to substantially reduce the cost of obtaining a donor heart. We were the first heart transplant team to successfully perform a heterotopic heart transplant in 2 children, aged 13 and 14 years, in 1980 and 1981, respectively. Because these patients presented with severe biventricular cardiac failure and arrhythmias, adult donor hearts were used as there was no time to wait for paediatric donor hearts to become available. The adult donor hearts fitted well into the chests of the children and there were no problems with lung compression. However, the donor hearts had a large stroke volume that caused severe blood pressure elevation in the immediate postoperative period. A combination of high doses of various drugs intravenously was used to control the high blood pressure, as it resulted in severe headache in the children once they were awake and extubated. Over the next few days, the donor hearts gradually adapted to the new circulation and the intravenous therapy was steadily decreased until discontinued. The immunosuppression regimen used was the 'classic' combination of corticosteroids, azathioprine and antithymocyte globulin with the addition of cyclophosphamide or actinomycin D when severe acute rejection episodes occurred. For the next 4 - 5 years after transplantation both children did extremely well, going back to school and living normal lives. However, as a result of the corticosteroids they received, they experienced some abnormal physical growth. Chronic rejection set in and both had to be re-transplanted. In both cases the new transplant was placed in the orthotopic position after removal of the patient's own heart. Although both previously transplanted hearts had developed severe coronary artery atherosclerosis and were in danger of myocardial infarction, they still had good myocardial contractility. It was therefore decided not to remove them, but to 'hook' them to the new heart in the heterotopic position. Both operations went well and the patients recovered completely. This time they were both commenced on cyclosporin A for immunosuppression, which proved more advantageous than the previous regimen, and both survived beyond 10 years after the first heart transplant. In the second patient, the second heart also failed owing to chronic rejection and a third heart transplant was performed, so this patient had 4 hearts in his lifetime. The first patient went on to become a long-term survivor, being alive at the time of writing more than 31 years after the initial heterotopic heart transplant. He has lived a fairly normal and active life, for example working as a game ranger for a while and being a hunter in the northern parts of South Africa. He has developed complications, but they have been successfully managed over the years. In 1990 a pacemaker was inserted to treat symptomatic sinus bradyarrhythmias of the orthotopic heart, and in 2002 open-heart surgery was undertaken for the placement of three coronary artery bypass grafts and a tricuspid valve annuloplasty on the orthotopic heart. He made an uneventful recovery from this major cardiac surgery. The fact that the second (orthotopic) transplanted heart developed chronic rejection (arteriosclerosis on the coronary arteries) almost 20 years later attests to the better immunosuppression afforded by cyclosporin A compared with the first (heterotopic) transplanted heart, which developed rejection 4 years after the operation.